Every day, Watch This offers staff recommendations inspired by a new movie coming out that week. This week: Because it’s Star Wars Week here at The A.V. Club, we’ve singled out some of the more interesting movies inspired or influenced by George Lucas’ beloved space opera. It wouldn’t be fair to Luc Besson to call The Fifth Element a straight Star Wars ripoff—and for that matter, Star Wars shouldn’t have to answer for Besson, either. The French director supposedly first conceived of his nutty sci-fi epic as a teenager, which would have been several years before A New Hope was released, and it has the kind grab-bag assortment of influences that make Besson’s claim that he wrote some of it as a 16-year-old utterly believable. But that stew of second-hand ingredients nonetheless includes plenty of movies released after Besson’s teenage years, and the film wasn’t finished and released until 1997 (the same year that the Star Wars special editions were reissued theatrically). As such, it’s fair play for a discussion of the Star Wars influence. To be sure, there are elements of hippie-dippie mysticism and Eurotrash in Besson’s film about the manifestation of a supreme being (Milla Jovovich) capable of fighting off a supreme evil, neither of which are especially Lucas-esque. (The mythology behind Jovovich’s Fifth Element makes the Force sound like hard science.) But by 1997, Star Wars had become a pervasive enough cultural force that many of The Fifth Element’s characters, both archetypal and quirky, harken back to it. Chief among them is Korben Dallas (Bruce Willis), the semi-rogue cab driver who gets drawn into a fateful intergalactic squabble by chance; it’s not as iconic a part as Han Solo, but it’s probably the closest genre veteran Willis has come to that mix of rough-hewn irreverence and wounded sentimentality. Korben’s chief human antagonist Zorg (Gary Oldman) isn’t particular Vader-like in manner, but he does answer to an even greater evil (the film’s real bad guy is a dark planet-like mass that at one point places a phone call) and, like Vader in A New Hope, doesn’t share much on-screen space with the main heroes. Many of the supporting players have analogues in the Star Wars universe, too: There’s a blue-skinned performing-arts alien and a cruise ship that’s like the Mos Eisley Cantina gone tourist, plus an amusingly out-of-place irritant (Chris Tucker’s Ruby Rhod) on par with C-3PO or Jar Jar Binks. Of course, Jar Jar Binks first appeared in The Phantom Menace, which came out two years after The Fifth Element. But part of what makes The Fifth Element oddly enduring for such a silly, borderline nonsensical sci-fi pageant is how it mashes together so many images and ideas that it starts to feel weirdly prescient; it’s a rip-off for all time. The cityscape where Korben drives his flying cab recall not just a brighter-lit Blade Runner (which, like Star Wars, came out after Besson was a teenager but well before his movie came to fruition) but the similarly influenced Attack Of The Clones. Story-wise, The Fifth Element has a much poorly translated gobbledygook as any number of later Besson productions. But, like Star Wars, the energy with which it rips pages from comics, frames from movies, and adolescent fantasies from its director’s brain makes it great fun. 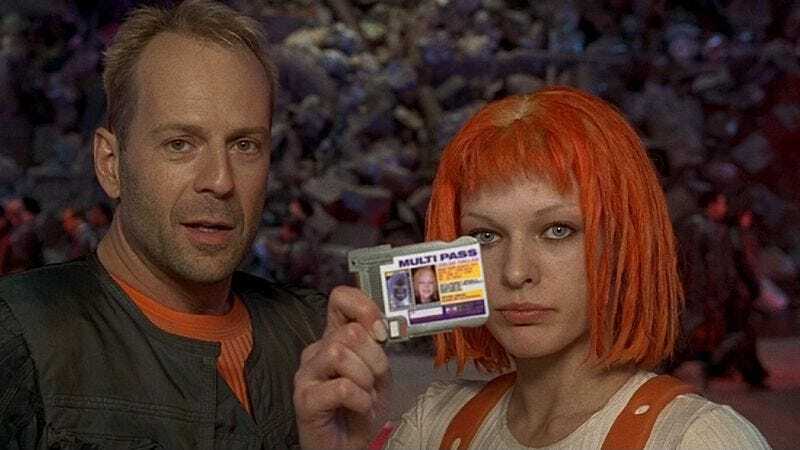 Availability: The Fifth Element is on DVD and Blu-ray, available from Netflix or your local video store/library, and for rental or purchase through the usual digital outlets.